Yttrium aluminum garnet (YAG) is a lab created gem first developed in the 1950's. Its primary application was in optics and laser technology, but it turned out to be a convincing diamond simulant. Although YAG has garnet in its name, it is not related to garnet; it is an artificial gemstone with no natural counterpart. 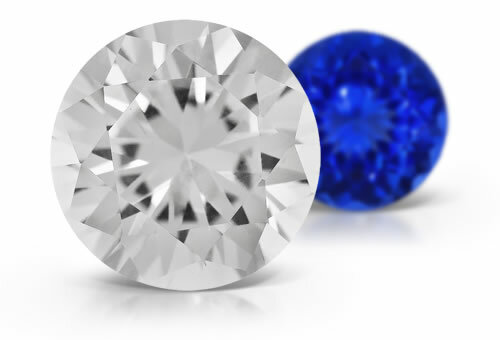 Negative reaction to diamond tester, OTL RI, lack of doubling, fluorescence, SG and pavilion flash.Well cut colorless stones will show mostly blue to violet pavilion flash. Stones show strong see through effect. Misnomers: synthetic diamond; green: synthetic demantoid. Coloring elements: green (chromium), blue (cobalt), red (manganese), yellow (titanium), purple (neodymium), pink, and orange. Has no natural counterpart. YAG generally is inclusion free but some might have gas bubbles. Pulled material might show curved striae. Green stones might show red flashes when viewed in transmitted light. If the stone is created using the flux method might show tiny grains, white flux or feathers.